At Sum Digital, we love exploring SEM tools – we try to find new ways to make them more efficient and to use them better. But sometimes, going back to basics is crucial to make the most of SEM. 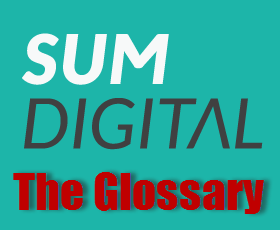 Here is the Ultimate Digital Advertising Glossary. Ad groups are part of a Google campaign and contain one or more ads. It is useful to have different ad groups for different products within a campaign. For example, if you have a campaign for shoes, you would want to have different ad groups for boots and sneakers. An audience is a group of users on Facebook that can be segmented a number of different ways, such as by demographics, likes and interests, or purchasing behaviors. Audiences should be created with respect to what type of Facebook user you think will be most interested in your brand/product. For example: You have an online store with high-end women’s clothing and you want to advertise it on Facebook. Using audience targeting, you can serve your ad to women ages 30 to 50, who have an income of $100,000 per year, and have an interest in major fashion brands. By targeting this audience you are likely to address the right people that might be in the market for your premium clothes. The conversion rate is the percentage of clicks on an ad that resulted in a conversion. This number is calculated by dividing the number of conversions by the number of ad clicks. Let’s say you sell watches. One hundred people clicked on one of your ads, and of that hundred people, twenty bought a watch from your website. Your conversion rate is 20/100 = 0.2, or 20%. A conversion tag is a piece of code that records a transaction on a web page. This transaction can be whatever your business considers a successfully converted user; a purchase, or a provided email address, for example. This tag is placed on the page that is shown to a user upon completing a conversion (such as a thank you or receipt page) and is linked to the ad, so that you can tell when a conversion came from a user viewing or clicking on that particular ad. For example, say I am looking for a vacuum cleaner and I search for vacuums on Google. I see several ads that show me different types and brands of vacuum cleaners, but I decide to click on an ad from Dyson that offers a vacuum for only $34.99. After reading through the page I decide to buy the vacuum cleaner. I fill in my address and credit card information and click the submit button which leads me to a “Thank You” page. This “Thank You” page contains a conversion tag that communicates with Google AdWords and makes it possible for Dyson to know that particular ad I clicked ultimately led to a purchase. When using CPC advertising (Cost Per Click) you pay only when someone clicks on your ad. Your effective CPC is a function of both your bid and your Quality Score, so it is important to have an ad that is relevant to your search terms and keywords; higher Quality Scores lead to lower average CPCs! Conversion rate optimization (CRO) is a process of increasing conversions by improving the landing page on the website. Optimizing your landing page is important because an improved conversion funnel can increase overall conversions without an increase in advertising spend. If you notice that a lot of people are clicking on your ad, but only a few of those clicks are converting into sales, you should begin thinking of ways to improve your landing page. Think about the user experience. Does your landing page have the same message as your ad? Are the calls-to-action easy to understand? Are there too many forms to fill in? A good way to test your landing page is by having someone use it that hasn’t seen it before, and getting their feedback. The funnel is the journey from click to conversion. When someone clicks on your ad, they are redirected to your landing page or website. Whatever happens from that moment on is a part of the funnel. Often the funnel can be divided into four parts: Awareness, Interest, Desire, and Action. It is important to understand your website’s funnel in order to know where to optimize the experience for the user. A good aid to see where people leave or “bounce” from your website is Google Analytics. Google Tag Manager (GTM) makes it easy for advertisers to create and update tags for their website and/or mobile apps. Tag Manager provides you with a code (called a container snippet), which you only have to place into the body of your website source code once. With a GTM tag in place, anyone with access to your GTM account can add HTML tags (such as an AdWords Conversion Tag) to any page or event on your site. Power Editor is a tool provided by Facebook that gives you the ability to create, edit, manage and optimize ads and campaigns. You can compare this tool with Adwords Editor from Google, although Facebook’s tool is offered in-browser rather than as a downloadable software application. Power Editor allows advertisers to create and edit ads in bulk, saving time when having to deal with large accounts. Retargeting allows you to show ads to people who have recently engaged with your brand, website, or product, using a retargeting tag. For example, say I visit an online store that sells socks called Happy Socks, but I don’t make a purchase. The next day, I’m checking my Facebook, and I see an ad for wool socks from Happy Socks in my newsfeed. This is possible because Happy Socks’ website tagged the cookie on my browser, and made sure that their Facebook ads are shown to users that were tagged as having visited their website in the past. A retargeting tag is a piece of code that tracks you for a brief window of time after you engage with a website. By using a retargeting tag, businesses can show you ads of products that you may have been interested in before, but haven’t yet purchased. Statistical significance means that a certain outcome was unlikely to have occurred by chance. In digital advertising, statistical significance is important for knowing if you can draw relevant conclusions from your ad data. If you look only at conversion rates, you might conclude that Campaign B is the most successful one. But take a look at the number of total clicks in that campaign: two conversions from just ten clicks has very likely occurred by chance when compared to Campaign A and C, which have many more clicks (signals) to lessen the effect of chance on their overall performance. This means that the data of Campaign B are statistical insignificant, and we cannot draw a conclusion. When using Adwords Campaign Experiments, Google shows you statistical significance indicators. These can help you understand whether the metrics you are comparing are truly different. The gray up-down icon tells you that the metric has not changed by a statistically significant amount. An upward pointing icon indicates that the metric has increased by a statistically significant amount. A downward pointing icon tells you that the metric has decreased by a statistically significant amount. A single arrow stands for a 95% probability of increase of decrease; two arrows stand for a 99% probability of increase of decrease. Three arrows indicates a 99.9% probability of increase of decrease. User experience, often abbreviated as UX, is the experience a user has while visiting your website. User experience is an important aspect of your funnel, since people will leave your page if they have an unpleasant or confusing experience. The easier and more appealing you make it for the user to navigate to a conversion, the more likely they will buy your product. Ask people to review your website that haven’t seen it before, and use their feedback to improve the user experience.